Nothing says summer like outdoor entertaining, long into the warm evening hours. 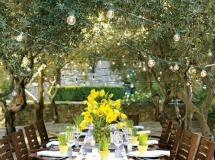 Whether it’s an intimate outdoor dinner party or a backyard soiree, lighting is the perfect entertaining accessory. From vintage-inspired Edison bulbs, to festive lanterns or super-chic outdoor floor lamps, keep reading for ways to use lighting to kick your outdoor entertaining up a notch! This summer, make lighting the centerpiece of your dining table. Consider using string lights -- either stuffed in tall vases or clustered around florals, shells or candleholders -- to create warm, colorful lighting in place of traditional centerpieces (Cable & Cotton, $39). Classic Edison bulbs add a touch of intimate vintage-inspired warmth to any outdoor party. Grab a string of bulbs (Pottery Barn $15 to $35) and run them through your backyard trees or stretch them from high points in your backyard space to create a virtual ceiling of lights. 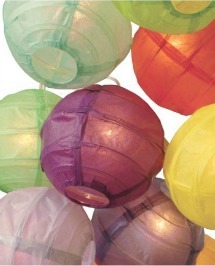 Lanterns are the perfect way to add bold pops of color to your outdoor space. They typically come in paper or nylon, and the color palate is virtually endless (Amazon, $6). You can drape your trees with lanterns or line them atop your outdoor walls to create a whimsical string of color. 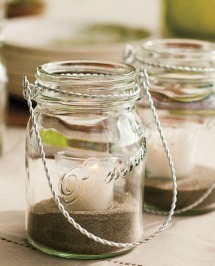 Hanging Mason jar lights (Pottery Barn, $8) bring an instant classic, casual feel to your outdoor entertaining. Stock them with tea lights or votive candles and hang them from branches, umbrellas or pergolas for ambiance. 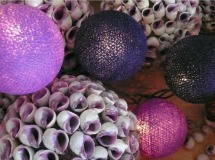 Or, you can display them at varying heights over your cake table, food table or bar to add emphasis to a focal point. 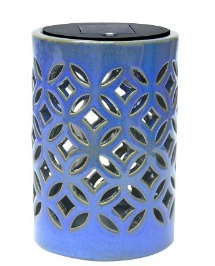 If you're looking to punctuate your outdoor accent tables with a punch of color, consider ceramic solar-powered lanterns (Target, $15). Ceramic lanterns can also double as centerpieces, to accentuate a clean, modern look. If you've opted for neutral linen and tableware, ceramic lanterns can serve as your stand-out pieces in solid colors or patterns. Choose lanterns with intricate cutouts that looks stylish by day and create a soft glow that peeks through the design by night. 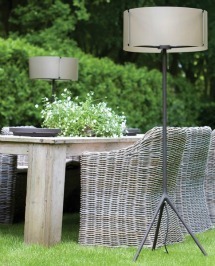 Outdoor floor lamps that bring the intimate feel of the indoors outside typically don't come cheap, but they make a major impact in your entertaining space. If you're looking for a go big or go home moment, invest in an ultra-sophisticated statement piece like this outdoor lamp by Tuli (Home Infatuation, $395).